Nicholas Hall is delighted to announce the exhibition Paintings by Carlo Maratti, opening on October 26, 2017 to coincide with TEFAF New York. 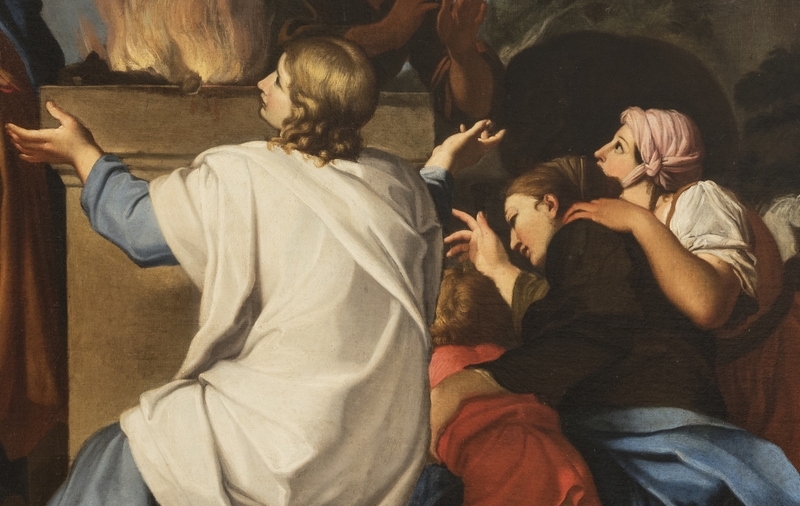 The exhibition will be the first ever dedicated to the painted works by Carlo Maratti (1625 –1713), an artist who was as successful a painter as Bernini was a sculptor in Baroque Rome. Despite his art historical significance and international influence that extended well into the eighteenth century, Maratti is represented in very few US public collections, and not one in the New York area. This is a rare opportunity to see significant works by this distinguished painter. The exhibition will bring together a few paintings of varied subjects spanning Maratti’s long career, highlighting a recent rediscovery of an early work from the Odescalchi collection. It is the prime version of a composition known from prints, preparatory drawings, and a later replica in the collection of the Duke of Devonshire, Chatsworth. Oval in format, and painted on a gallery scale, it represents the Old Testament scene of The Sacrifice of Noah. In addition, we will be exhibiting a portrait of Maratti’s third wife, Francesca Gommi, as well as a portrait of their daughter, Faustina, as Saint Margaret. A major early work representing Saint Andrew is being generously loaned by the Earl of Wemyss. Dr. Stella Rudolph, author of the forthcoming monograph on Maratti, has written the introduction to the exhibition catalogue. This will be the first Old Master paintings exhibition to be held at Nicholas Hall’s new gallery. Carlo Maratti (1625 – 1713) was the single most important Roman artist in the second half of the 17th century. He was admired as an exponent of the grand classical style in the tradition of Raphael and Poussin, painting popes and works for foreign patrons including Louis XIV, King of France. Best known for his altarpieces, Maratti also painted major frescoes, portraits, and designs for sculptures and architecture.